This offseason has not exactly been exciting, but there is finally a glimmer of news. According to Denmark's BT, Metro is close to acquiring 18-year-old striker Mathias Jorgensen from Odense. After appearing in two games in 2017-18, the striker is currently in his first full season with the club. 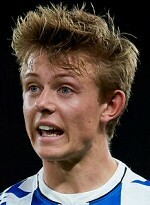 So far, the Danish youth international has scored two goals in 13 games. According to BT, the "lightning fast" Jorgensen traveled to New York yesterday to "inspect the club". Supposedly, OB and RBNY have "already reached agreement on a transfer fee".